General purpose dishes such as this may have been used for almost any type of food, as well as serving a decorative function when not in use. Little distinction was made between bowls and dishes, cups and porringers, jugs and mugs. Werra slipware was just one of the many types of pottery which could not be replicated in England, and which was valued for its stylish decoration. 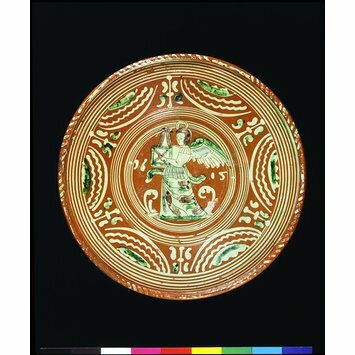 At the same time as these dishes were made by clusters of potteries along the River Werra, a similar range of slipware dishes, much plainer and mainly decorated with geometric designs, was made along another German river, the Weser. A stock range of stylised figures such as soldiers and clowns was developed for use on these dishes. These figures were reproduced over a long period but have no significance other than as decoration. What is distinctive about Werra slipwares is the mixture of techniques. On a surface that would betray even the slightest mistake the slip-trailing is handled deftly, while the sgraffito decoration shows a masterly drawing technique. 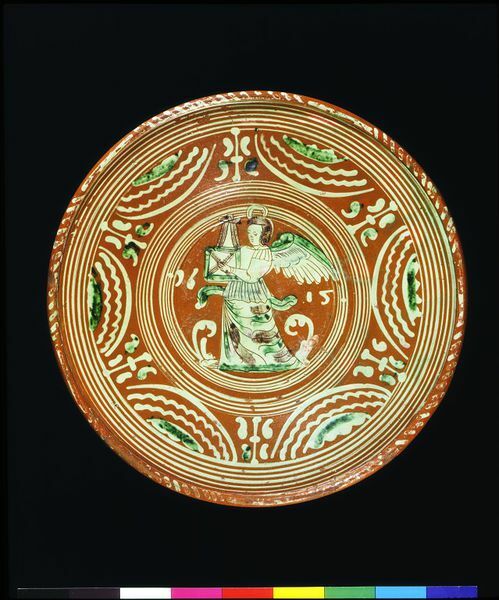 Red earthenware dish decorated with trailed white slip, the detailing of the central figure of an angel scratched through the slip in the sgraffito technique, with the date 1615.